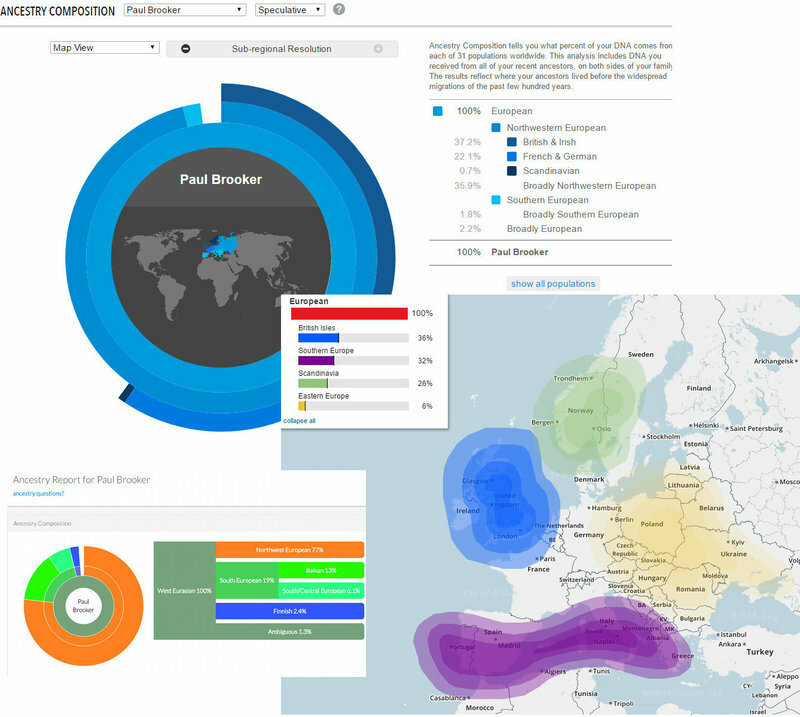 I'm writing this post in response to a number of comments that I see online with regards to using a commercial DNA test, in order to ascertain ancestry. Quite often, when someone asks how to find out their family history or ancestry, someone will come back with an answer in the form of "just spit in a vial, send it to Ancestry.com, and they'll tell you". It's not really that simple, so I'm making this post, to explain how an ancestry DNA test can help, or not help, you discover your ancestry. Nicely dumbed down I hope, for the beginner. Traditional genealogists usually set out to create a genealogy (family history and tree), using interview techniques, artefacts, and oral memories, recorded from older relatives. Artefacts might for example, include old family medals, or photographs. They then extend the research, through documentary evidences, such as birth, death, and marriage certificates, church registers, census records, transcripts, electoral rolls, and military records. If they are interested in recording all ancestral information, and not merely a single line such as the surname line, then this research can go on for months, years, even decades. What you cannot do, is to simply pay a small fee, and your entire family history drops through the letter box in a brown envelope. It takes years of time to research, collate, and to verify a good family tree. Most genealogy enthusiasts don't mind this, because they actually enjoy doing the research itself. It becomes a hobby, even sometimes a passion. However, a number of commercial DNA companies may give the general public the impression, that you now can simply pay a fee, spit or swab, and your ancestry magically appears for you on a website. It's big business. Does it work though? Exactly what is genetic genealogy? What is Ancestry and why do we care. Ancestry can simply be defined as our descent from forbearers. Why do we care who they were? Which forbearers or ancestors? How many are there? How far back? Of course, not every one does care. Not everyone cares about history. But for other's how we define ourselves, our communities, and families, it does matter. It tells us who we are, where we came from. It defines us, gives us grounding. It gives us identity. Wars have often been inspired by ancestry. At the same time, a deeper appreciation of the human family, and it's common ancestry, can be used to relate to those elsewhere. One big family. Discovering the immense poverty and hardships of our ancestors can help us to appreciate what we have, and to help others in need today. These are only your 510 most recent direct ancestors, yet just those generations, will take you back to only around 250 years of family history. Now add all of the recorded children of these direct ancestors - the great great uncles and aunts to the theoretical family tree. You're probable going to have a tree of around 1,300 individuals. That is just for 250 years. You have a big family Go back a few more generations, and it will explode before you reach far. All of those direct ancestors though, are a part of your ancestry. You'll most likely carry some DNA from most of them. They are, from a biological perspective, who you are. By the way, the number of biological ancestors will not continue to increase infinitely. Because increasingly, you will find couples within your tree that are distant biological cousins of each other. As this accelerates through thousands of years, that explains how all modern people around the world, all descend from a very small population around 100,000 years ago. So before considering what DNA can do for genealogy, we need to consider which ancestors matter to us. Do you just want to know who your biological parents, or grandparents were? Do you want to know the names, places and social positions of your ancestors over centuries? Do you want to know which parts of the world that your ancestors lived 500 years ago? Do you want to know how some of your prehistoric ancestors moved across the globe, thousands of years ago? Maybe you want to know everything. Let's now turn to genetics for genealogy, and how DNA tests can answer some of these questions. The haplogroups are chains, or markers, that are carried on one of only two strict lines of descent. They do not apply to your entire ancestry - just two lines. As we saw above, we have 256 g.g.g.g.g grandparents (unless any of their descendants reproduced together). Our haplogroups came from only two of them. Your haplogroup does not define you. Yet, it's quite odd, because very quickly, many genetic genealogists do relate to them, rather like a hereditary football club. They do become an identity, only if you enthuse over them. The Y or paternal haplogroup, follows the strict paternal line. From father to son. Women do not have a Y chromosome, so cannot pass it on. It has to come from the biological father. However, within this constraint, Y-DNA is particularly useful to genealogists. It mutates often, both as STRs and less often, as SNPs (snips). Because of these frequent mutations, it is useful for tracing shared descent with others. 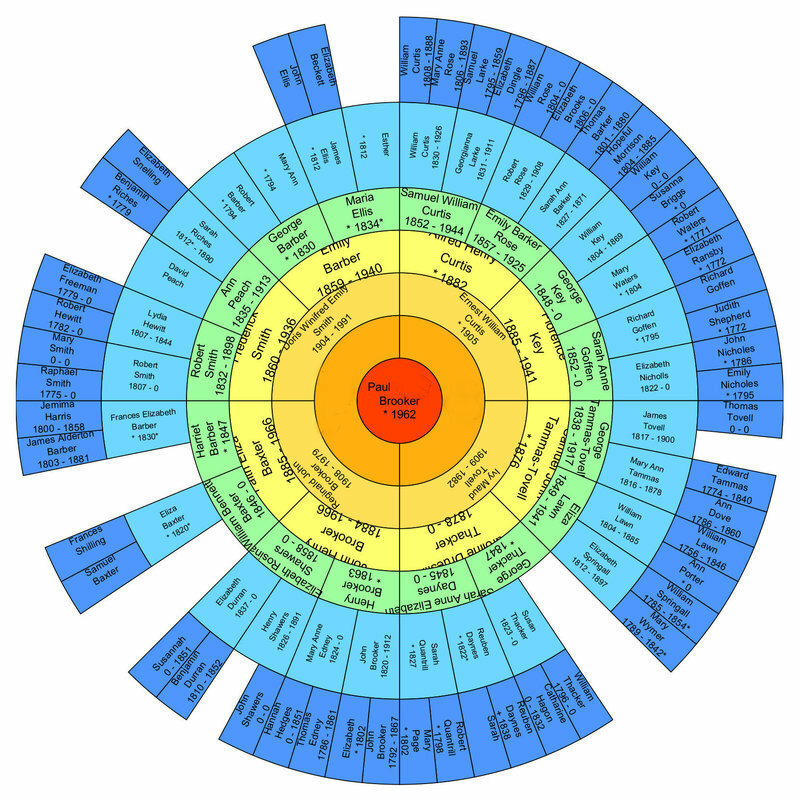 It can also be aligned with surname studies. The champion commercial DNA company for Y-DNA research, is Family Tree DNA. The mt or mitochondrial (maternal) haplogroup, follows the strict maternal line. From mother to children. Both sons and daughter inherit their mt-DNA haplogroup from their biological mother. However, only the daughters can pass it down. Two downfalls to mt-DNA for genealogy. 1) The surname frequently changes, traditionally nearly every generation through marriage. 2) it doesn't mutate as frequently as the STRs of Y-DNA. It is still a useful tool, and can prove descent through the maternal line. It can also still be used for studies of much deeper, ancient ancestry. This is the bulk of you DNA. All of the snips (SNPs), that make up who you are genetically. You receive approximately 50% from each parent, 25% from each grandparent, 12.5% from each great grandparent. This subdivision cannot go on forever, and indeed, once you go back much more than six generations, the approximates start to deviate, so that you may have no snips at all from a particular line that joined your family tree over 250 years ago. The problem with autosomal DNA is that it can be such a mess. It recombines randomly with every generation. Therefore, it is much harder to track ancestry in the same way, that we can with the haplogroups. Not everyone knows who their biological parents were, or where they came from. This is the first use of DNA testing. It can be used to find, test, or prove recent descent. The first hurdle of genealogy. Both haplogroup evidence, and autosomal evidence can be used to prove or determine relationship. Many genetic genealogists, use DNA to find distant, and sometimes not so distant cousins. The hope is that they can link trees, share knowledge and research, perhaps copies of artefacts. Therefore an awful lot of genetic genealogy is about tracing genetic relatives, and establishing common ancestry. 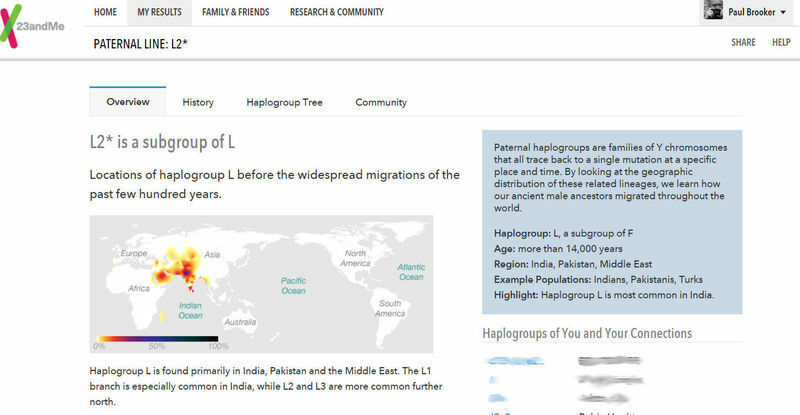 Haplogroup Projects. The Y haplogroup is favoured for it's frequent STRs, and also for it's link to surnames. Family Tree DNA projects track the STR and SNP data of it's members, tracking families, relationship, known mutations. Project administrators at FTDNA can predict relationship to other members in the project. Your Y cousins. Shared segments. Autosomal DNA can be used for finding distant cousins. 23andMe for example, have Relative Finder. Alternatively customers of any commercial DNA company that gives them access to their raw data, can upload that data to GEDMATCH. At GEDmatch, they can search for other kits, looking for lengths of shared segments (measured in cM - centimorgans) on the autosomes or X chromosomes. The longer or more segments can be used to indicate shared ancestry. It is important to understand, that this is not about directly tracing ancestry. It is only about establishing shared biological ancestry, with other researchers, with which you may be able to share resources. In the old days of genealogy, we would find distantly related researchers by browsing through annually printed surname interest directories. Here, the same thing is happening, but we are finding people by comparing DNA. Most commercial DNA companies providing ancestry information, now use their own propriety calculators to look at the autosomal DNA of their customers for patterns that they can relate to a number of reference populations. 23andMe for example, uses Ancestry Composition to determine what parts of the world, that the ancestors of their customers lived 500 years ago. They predict from this in percentages of ancestry. However, it is very much a developing art. The problem is that genes have been randomly mixing and moving around ever since prehistory. The customers of these DNA companies want hard facts. They want their ancestry accurately pin pointed down to modern or ancient nation-states, or to historical populations such as the Vikings or Huns. Ancestral DNA companies are under pressure to provide this deep ancestry. However, can they? Ancestral analysis of DNA can be very enlightening. It can provide some surprises within a family history. However, it's accuracy is exaggerated. It is increasingly successful at predicting ancestry from a particular corner or end of a particular continent. But it cannot for example, accurately tell French, British, and German ancestry apart to any high accuracy. It can recognise some populations better than others. It cannot tell anyone if they had Viking ancestry. This is a particular value of the haplogroups. As we accumulate more and more data on more mutations, as we expand the recorded database, and as we relate that to more ancient DNA extracted from referenced and dated ancient human remains, so we will be able to better explore the population genetics not only in history, but deep into prehistory. However, it is also becoming increasingly realised, that patterns of ancient admixture can also be detected within the autosomes. Although Autosomal DNA ancestry calculators claim to reveal relatively recent admixtures over the past 500 years, it is becoming clear that these are being confused by much older patterns of admixture. These patterns can now be explored and probed on a number of GEDmatch programs. People can compare their DNA with the kits from ancient DNA, or predict just how much of their ancestry was likely "Western Hunter-Gatherer, or "Early Neolithic Farmer". In addition, more DNA companies are now measuring for much more ancient admixture with archaic populations such as the Neanderthals. Genetic Genealogy is fun, great fun. It is not however, a quick and easy replacement for traditional genealogy. Unless you get lucky with some comparative Y-DNA in a project, it is not going to directly tell you the names or social status of any ancestors. It can give you a phylogenetic tree, but not any kind of family tree that you can bore other family members with. Genetic genealogy can provide some tools to some researchers. It can test biological relationship. It can be used to predict some of your ancient history. For most researchers, particularly those that are able to interview many local family members, search local grave yards, access archives and records - it has no, or little value to the pursuit of collecting ancestors. I personally love to explore my genetic genealogy. But it is documentary research that provides the names. Genetic genealogy for myself, is more about the long and ancient journey.